St. Seraphim was born on July 19August(1), 1759, and named after St. Prokhor, whose feast day is celebrated on the 28th day of that same month. His father’s name was Isidore, and his mother’s Agafia. His parents came from respected and wealthy merchant families. Isidore had taken up the task of building a church dedicated to St. Sergius of Radonezh , but he died before he could complete it. He therefore conferred the task upon his wife. The young Prokhor often accompanied his mother as she supervised the church’s construction. One day he climbed with her to the top of the belfry, and slipped through the scaffolding, falling to the ground. His frightened mother was sure she would find him dead. But the words of the 90th psalm seemed clearly to guard the blessed child:For He shall give His angels charge over thee to keep thee in all thy ways. They shall bear thee up in their hands, lest thou dash thy foot against a stone. When she had descended to the ground she found the boy standing on his feet, whole and unharmed; an indubitable indication that Prokhor was under God’s special protection. His piety in childhood was exceptional, a quality encouraged by his mother. At one time the young Prokhor had become very ill, and the Mother of God appeared to him in a dream, promising to heal him. Here is how her promise was fulfilled: a procession was passing by the house of Prohkor’s family, carrying the wonder-working Kursk Root icon of the Mother of God. When rain began to fall, the procession changed its course and passed through Prokhor’s yard. Agafia carried her sick boy to meet the miracle-working icon, and placed him under the protection of the Mother of God. From that moment the child quickly recovered. In his younger years, Prokhor assisted his older brother in his shop, but the desire of his soul was to become a monk. His pious mother did not interfere with his soul’s yearning—she blessed him for the monastic path with a copper cross, which he never removed from around his neck until the day he died. Having received his hoped-for blessing, Prokhor returned to Kursk where he stayed for two more years, after which he departed from family and worldly life with two friends, setting out upon the monastic path. On November 20, 1776, in the evening dusk, three young pilgrims approached the gate of the Sarov bell-tower. Among them was Prokhor. That evening the All-night Vigil would be celebrated for the feast of the Entrance into the Temple of the Most Holy Theotokos. The entrance to the Sarov Dormition Church was open, and the festal All-night Vigil was beginning. Prokhor’s soul rejoiced—he had found his place. Within two years after entering the monastery, Prokhor became extremely ill with dropsy. Abbot Pachomius and Elder Joseph looked after him. Seeing the sick one’s grievous condition, Abbot Pachomius proposed calling a doctor. But Prokhor asked them to provide him instead with heavenly medicine—communion of the Holy Mysteries. Elder Joseph zealously served a Vigil and Divine Liturgy for the healing of the sick one, confessed him and served him Holy Communion in his cell. After that Prokhor was quickly restored to health. Later on, he described to many, that after Holy Communion the Most Pure Virgin appeared to him in an indescribable light with the Apostles Peter and John the Theologian, and, turning to Apostle John, said, pointing to the sick one: “He is one of our generation,” that is, of the heavenly. The Mother of God touched Her scepter to his thigh, from which water came forth. Until the end of his life a deep impression remained on his body. In one year they began to build a large enclosure containing a church over the place where his cell was, with the church located directly over the spot where the Mother of God had appeared. After Prokhor’s health returned he was sent out to collect donations. He was also in Kursk and happened to see his mother. But he passed his former house completely by, as his soul was already above the world. At the end of the Dormition fast, August 13, 1786, Abbot Pachomius tonsured the novice Prokhor into monasticism, and named him Seraphim, which means in Hebrew “like a flame.” This name was given to him because of his fiery love for God. After this he intensified his podvig of silence. Three years later Fr. Seraphim was blessed to become a deacon and was ordained by Bishop Victor of Vladimir. The Superior rarely served without Fr. Deacon Seraphim. Before services Fr. Seraphim would spend whole nights in prayer. At the end of the service he would remain in the church, putting the utensils in order. He would say: “Those who go to church should never say anything within it that is not necessary. And what is more beautiful, higher or glorious than a church?” He also would say: “Why can’t a man serve God at all times as do the angels?” He saw angels more than once during divine services. “Their appearance was as lightning, their clothes white like snow, or like golden cloth, their singing is impossible to describe,” he would speak of them. “One day it so happened,” said the Saint, “that I was serving Vespers on Holy and Great Thursday. Divine Liturgy began at 2:00, as usual, with Vespers. After the lesser entrance and reading, I, the lowly one, pronounced at the royal doors: ‘Lord save the pious and harken unto us!’ Entering the royal doors and lifting my stole to the people, I finished: ‘And to the ages of ages.’ Suddenly I saw a ray of light as from the sun. Looking at this radiance, I saw Our Lord and God Jesus Christ in the image of the Son of Man, in glory and unspeakable light and brilliance, surrounded by the heavenly powers, angels and archangels, cherubim and seraphim, like a swarm of bees, coming from the west church doors as from the air. St. Seraphim’s appearance changed, and stricken completely by the divine vision, he could not even move from his spot by the royal doors. Fr. Pachomius noticed, and sent two other hieromonks, who, taking him under the arms, led him to the altar. But he continued to stand there for nearly three more hours without moving, in total astonishment. Only his face changed the whole time, becoming white as snow, then flushing red. After the divine services were over, Elder Pachomius asked him what had happened. Fr. Seraphim, who never hid anything from his spiritual fathers, related it all to them. They bid him to cloak himself in silence and to delve ever deeper into humility, to save himself from conceit that could arise from such an extraordinary vision. The Saint accepted this instruction with all meekness, and remained silent until the necessary time. What the God-pleaser experienced during Holy Communion is known to him alone. “I want them to receive Christ’s Holy and Life-Giving Mysteries, Batiushka, during all the four fasts, and all the twelve major feasts. I would even like them to receive more often than on feast days alone; the more often the better. Mother Alexandra said that she could only ask, but it is the Heavenly Queen Herself who would give him this duty. Seven years had passed from the time Fr. Seraphim was tonsured into monasticism and four years since his ordination as a deacon. Fr. Pachomius grew nearer to death, and wished to see Fr. Seraphim in full priestly glory. On September 2, 1793, he was ordained by Bishop Theophilus of Tambov. 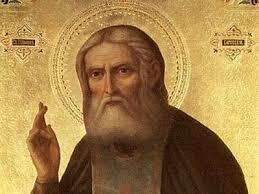 The years that had led St. Seraphim to the staff of God ignited in him a fiery thirst to leave for the desert. His mentors were leaving one after the other for a better world. Fr. Joseph, his first elder, left long ago. Fr. Pachomius, who loved him fervently, was preparing to depart. Fr. Seraphim looked after him, and gave him his word to care for the Diveyevo sisters. Fr. Pachomius was overjoyed and kissed him. After that, he peacefully departed to God. Having cried over his friend and benefactor, Fr. Seraphim requested permission from the new abbot, Fr. Isaiah, to depart for the hermitage, and he received written permission. This was again on the feast of the Entrance into the Temple of the Most Pure Mother of God, November 20. On this day, sixteen years before, the young Prokhor had stepped through the monastery gates. Now, with a flaming soul Fr. Seraphim stepped through them in the other direction—not into the world, but deep into the desert. The Mother of God knew him, and sent him into the Holy of Holies, closer to Herself and to God.